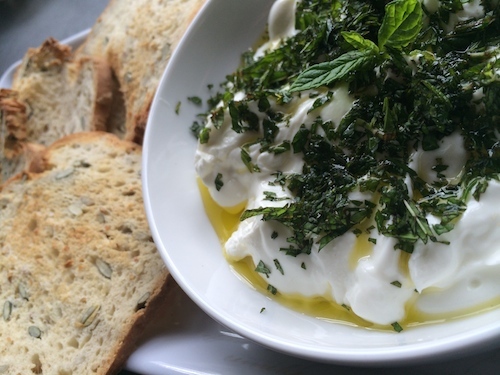 … there is nothing better than Homemade Labneh as a tasty snack. I first ate labneh in Turkey where it was made daily by my friend’s family I was staying with. We ate it fresh with eggs, fresh bread and olives. The slight sourness of the labneh is refreshing and the addition of fresh herbs just gives the dish a nice lift. I love labneh with lemon zest, chopped fresh mint and a drizzle of olive oil and eat it with fresh bread. If you have nice bread, why not slice it thinly and bake it in the oven for a quick savoury biscotti. Otherwise, the good old cracker will do perfectly. In a bowl mix a teaspoon salt with the yogurt. Line a sieve or colander with a cheesecloth (I am using white cotton handkerchiefs) and dip the yogurt in. Tie the ends together and hang over a bowl (needs to be free-hanging). You will see liquid dripping from the cheesecloth as the salt is eating away on the yogurt. After about 12 hours the yogurt will have become more solid – the longer you keep it, the more solid the labneh gets but I wouldn’t hang it for more than three days. Place the labneh in a bow and mix with the lemon zest, mint and check if you need any more seasoning. Drizzle with olive oil and serve with crackers or bread.